Mars, photographed by NASA's Viking mission. NASA will reveal a "major science finding" about Mars on Monday morning (Sept. 28), and you can follow the announcement live. 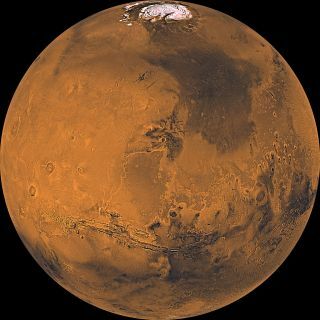 Researchers and NASA officials will unveil the discovery — which the agency described in a media advisory as a "Mars mystery solved" — during a press conference Monday at 11:30 a.m. EDT (1530 GMT). You can watch the Mars announcement live on Space.com, courtesy of NASA TV. NASA currently operates five spacecraft around and on Mars — the rovers Opportunity and Curiosity, which landed in 2004 and 2012, respectively, and the orbiters Mars Odyssey, MRO and MAVEN (which stands for Mars Environment and Volatile Evolution). Mars Odyssey arrived at the Red Planet in 2001, and MRO got there in 2006. MAVEN just celebrated its one-year anniversary in Mars orbit last week. Europe's Mars Express spacecraft and India's Mars Orbiter Mission probe are also still eyeing the Red Planet from above, bringing the number of currently functional Mars orbiters to five. MRO's HiRISE camera features a telescopic lens that can pick out features as small as 3.3 feet (1 meter) across on the Martian surface. The camera also collects images in near-infrared wavelengths, allowing researchers to learn about the mineralogy of Mars. "These new, high-resolution images are providing unprecedented views of layered materials, gullies, channels, and other science targets, in addition to characterizing possible future landing sites," NASA officials wrote in a description of the HiRISE instrument.